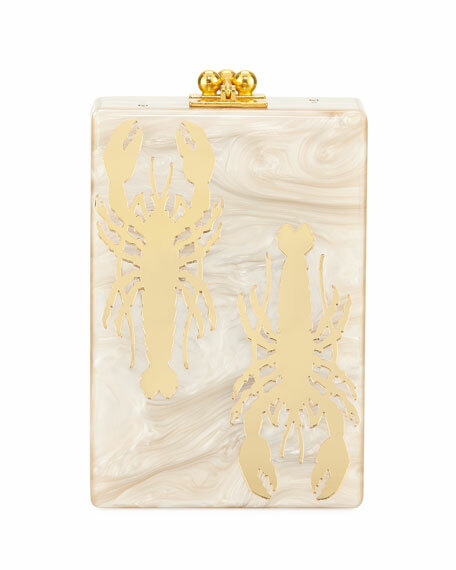 Edie Parker "Jean" acrylic clutch bag. Hinged top with kiss lock clasp. Fits up to iPhone® 8+ and X. Exclusively ours. 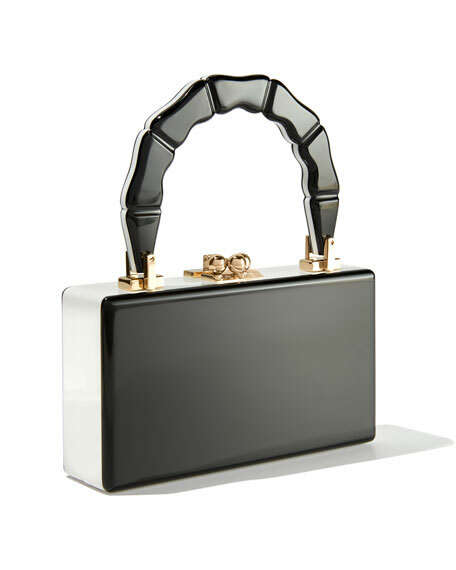 Edie Parker pochette bag in satin with with scalloped acetate frame. Detachable curb-chain top handle, 5" drop. Fits smart phone, including Apple iPhone 8/7+. 6"H x 8"W x 3.3"D. "Aliza" is made in Italy. IMAGO-A grain leather top handle bag with golden hardware. Flat top handle with acrylic beaded trim. Flap top with turn-lock closure. Exterior, slip pocket at back. Logo at center front. 7.7"H x 11"W x 3.2"D. "Carr" is imported. Nancy Gonzalez satchel bag in signature Caiman crocodile. Flat top handle, 2.5" drop. Self-covered chain shoulder strap, 18" drop. Flap top with hidden magnet. 7"H x 9.5"W x 3.3"D. Weighs approx. 1 lb. 6 oz. Made in Colombia.